This is a review on the MONU Extra Rich Night Cream for Dry / Sensitive skin. I received this as a sample from a one off GlossyBox I purchased, and it was the one product that caught my eye as I'm really enjoying skin care products at the moment. A generous 20ml sample of this cream has given me enough time to establish what I think about the product and I must say its fantastic! 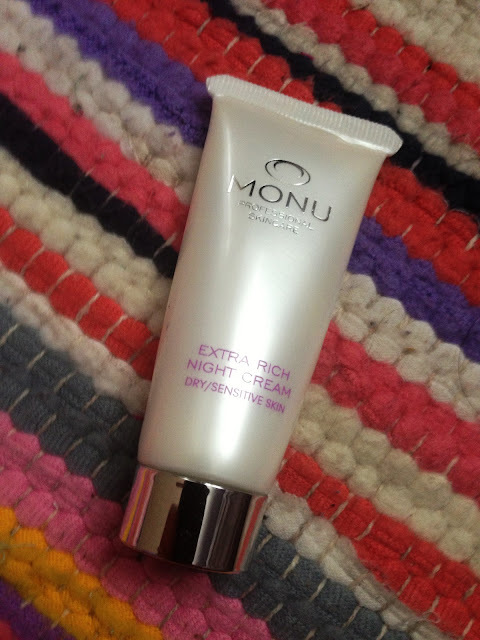 MONU claims that its Extra Rich Night Cream nourishes and firms skin which I totally agree with - its certainly improved the dry patches on my face and my skin feels more soft and supple. The cream contains such goodness as royal jelly, vitamins and evening primrose which is the ingredient that helps soften the skin. I guess I should mention the scent. This cream has a 'mature lady' kind of scent...if you know what I mean. Not to say its a bad scent, but the scent I feel suggests that this cream is suited for more maturer skin types. (Not that I'm getting any younger). MONU's advise is to apply their cream after cleansing and toning which is what I do anyways. It has a nice thick (but not too thick) formulation, which is what I prefer for a night cream. I apply a thin layer over my face and wear it as a mask and allow it to sink in by itself. I never heard about these products . After such great reviews i would like to try it at least once . The products is very expensive but nice that the results are great . The site is about extra rich night cream, Hair and beauty products can help you to collect moisture and protect your face. It is your duty to get best products and use them without any risk, thanks a lot.